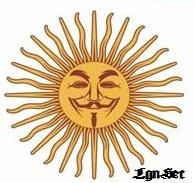 Anonymous Press: Anonymous - Message for mining and energy companies in South America. 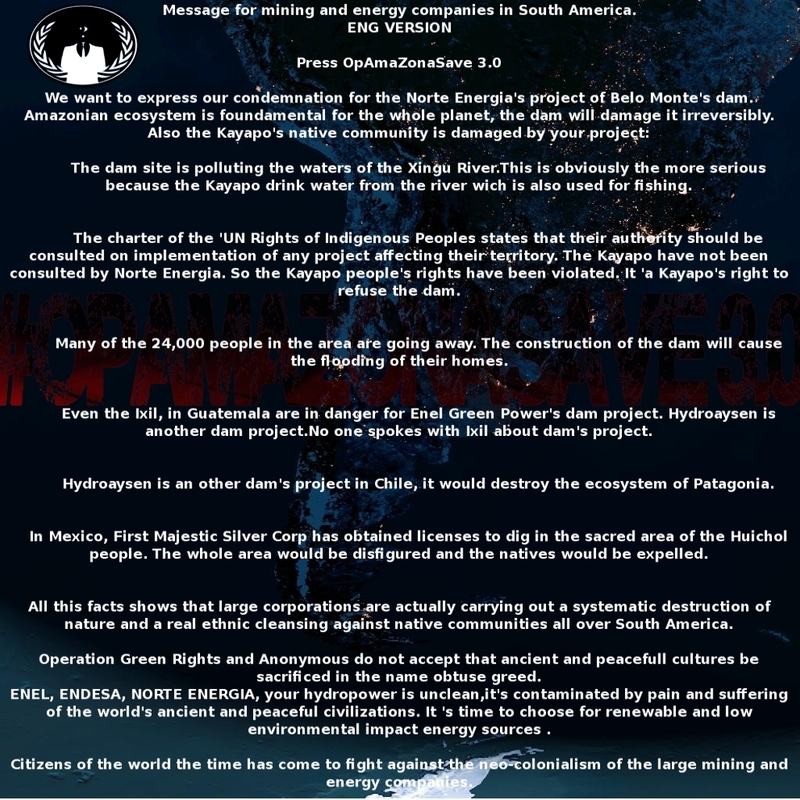 Anonymous - Message for mining and energy companies in South America. We want to express our condemnation for the Norte Energia's project of Belo Monte's dam. Amazonian ecosystem is foundamental for the whole planet, the dam will damage it irreversibly. The dam site is polluting the waters of the Xingu River.This is obviously the more serious because the Kayapo drink water from the river wich is also used for fishing. The charter of the 'UN Rights of Indigenous Peoples states that their authority should be consulted on implementation of any project affecting their territory. The Kayapo have not been consulted by Norte Energia. So the Kayapo people's rights have been violated. It 'a Kayapo's right to refuse the dam. Many of the 24,000 people in the area are going away. The construction of the dam will cause the flooding of their homes. Even the Ixil, in Guatemala are in danger for Enel Green Power's dam project. Hydroaysen is another dam project.No one spokes with Ixil about dam's project. Hydroaysen is an other dam's project in Chile, it would destroy the ecosystem of Patagonia. In Mexico, First Majestic Silver Corp has obtained licenses to dig in the sacred area of the Huichol people. The whole area would be disfigured and the natives would be expelled. All this facts shows that large corporations are actually carrying out a systematic destruction of nature and a real ethnic cleansing against native communities all over South America. 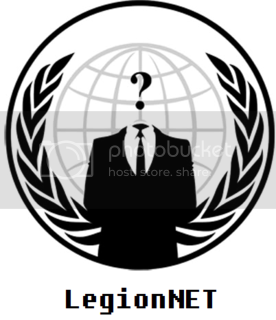 Operation Green Rights and Anonymous do not accept that ancient and peacefull cultures be sacrificed in the name obtuse greed. ENEL, ENDESA, NORTE ENERGIA, your hydropower is unclean,it's contaminated by pain and suffering of the world's ancient and peaceful civilizations. It 's time to choose for renewable and low environmental impact energy sources . Citizens of the world the time has come to fight against the neo-colonialism of the large mining and energy companies.